There are some useful parameters which we can use in the Voice notebook query string. The most importants are: vid (1 — compact view), autostart (1 — autostart), chkbufer (1 — Transfer to clipboard is checked ), pagelang (speech recognition language code), chkbeep (turn off sounds checkbox setting), chkinteg (turn on integration mode). This link will start Voice notebook in the compact view with the checked Transfer to clipboard options and also will start speech recognition in the US English language (you must previously install the Chrome extension to use transfer to clipboard feature). Another example – we can use https://voicenotebook.com/?autostart=1&chkinteg=1&pagelang=en-US to start Notebook in the integration mode (in this case additional module must be activated previously). The nonzero values of the parameters in the query string will have precedence over the default values and yet user account setting in the Voice notebook. After opening Notebook with parameters we can use Chrome menu: More Tools->Add to taskbar to create the shortcut for starting it with our parameters in the future. This shortcut will use Chrome browser even if the default browser would not be Chrome. You can force Chrome shortcuts to open Notebook as a window in the Apps tab or simply by setting Open as window checkbox. Sometimes it is convenience to set the Voice notebook’s window on top of the other windows. This setting can help in this task for windows OS. Linux OS allows setting windows on top by the OS native tools. 06.02.2016. The chkauto parameter is now obsolete, because Restart on errors checkbox is checked by default today. This entry was posted in voice input on August 30, 2014 by admin. I understand that for a minimal fee I can integrate this programme with Windows X. Can you kindly tell me how I order this? Hi Matthew, you can try the program and order the extended features in the user profile page. Sign Up, login to the account and go to your user profile page. I would like to know how can I hide other languages. because I just use two languages. 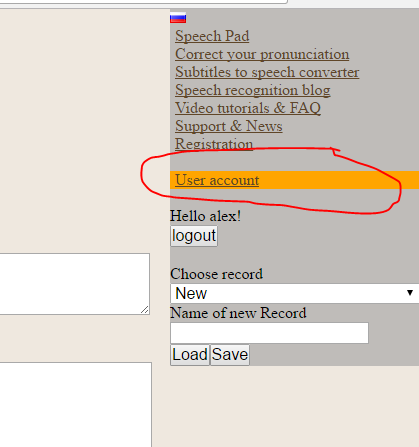 Go to Speech languages page in the user account. And press “Hide predefined language” button. see https://voicenotebook.com/blog/speech-input-languages/ for picture.